As a kid, tomato soup was a staple in my home. My mom always made it just a little more special by adding crackers smeared with butter. It was such a treat to see them floating delicately on top of a hot bowl of soup. It’s one of my first, and fondest food memories. Now I look for little ways to elevate my soup for my family and friends. Believe me when I say there’s no need to be Martha to serve a picture-perfect bowl. These add- ins or as I like to call them, accessories, are easy and can transform a simple bowl of soup into something special in just minutes. For the kids– Offer fun add-ins like Goldfish, or grilled cheese fingers. Freshen up- Use fresh herbs like a sprig of Thyme, Oregano, Cilantro, Parsley or Rosemary, or pick the leaves off and sprinkle on top. Bruschetta for the win– Keep a baguette in the freezer for a fast add on to your soup. Simple toast slices and top with melted cheese, or a scoop of fresh ricotta sprinkled with salt and fresh ground black pepper for a hearty addition to any bowl. 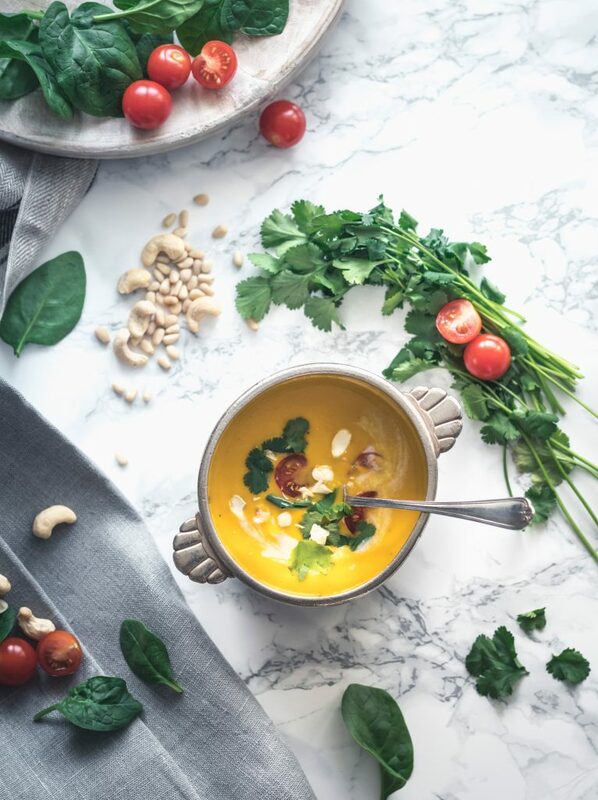 Drizzle It, Just a little bit– Drizzles of flavored oils like truffle oil, or even just a really good quality extra virgin olive oil make lovely layers of flavor in soup. Spice it up– Hot sauce, chili oil, chili flakes and sprinkles of cayenne are all good picks for kicking your soup up a notch on the heat index. Cheese please- Freshly grated hard cheese like Parmesan and Pecorino are great to top off a bowl of soup. You can also add some tuiles or crackers of the same cheesy flavor profiles for a nice crunch. Get nutty- Toasted nuts like chopped almonds, walnuts and hazelnuts are great for adding texture and flavor. Seeds are great add- ins too, like spiced pumpkin seeds. A dollop will do– A tablespoon of sour cream, Greek yogurt, ricotta cheese, or mascarpone make for pretty floats on a bowl of soup and create creamy texture when stirred in. Toast with toppings– I mentioned Bruschetta above, but you can also simply toast your favorite bread and smear with a variety of toppings for a complementary garnish. I recommend thinner slices and cutting into smaller pieces for easier handling. Pita toast points with hummus, whole grain toast triangles with goat cheese, or Texas toast with a sprinkle of salt, are just a few great toast options. Citrus –Citrus zest adds a great pop of color and flavor. Finely zested – lemon, lime, orange and grapefruit can all be used on top of soups or to sprinkle on top of the dollops, drizzles and toast points above for added flavor and color. This post was sponsored by Campbell’s Well Yes Soup. All opinions are my own.